Панель быстрого запуска для программ, файлов и папок (и вообще всего, что можно запустить), которой можно придать форму спирали или круга. Имеет гибкие настройки, красивую анимацию, совместима с иконками и скинами других подобных программ (RocketDock, ObjectDock и др.). Отличительной особенность Circle Dock является то, что её можно активизировать в любом месте экрана (с помощью 'горячей клавиши' или мышки), а не только по периметру одной из сторон десктопа. Так же программа может работать с флэшки. Какая Винда? .Net Framework 2.0 установлен? то же самое, .Net Framework 2.0 стоит. So Thank You Very Little And Send Me Postcards From Hell! * Before using the program, ensure that you have the .Net Framework 3.5 or later installed on your computer. If you are unsure, go to http://www.microsoft.com/net/Download.aspx and install it. Some users have reported instabilities with the program and installing the latest framework seem to help. Note: Circle Dock 0.9.2 Alpha Preview 6 should now run on both 32-bit and 64-bit Windows OS's. • Alpha 7_3 fixes a bug in the settings panel where it did not save the changes to the font and color for the Labels tab. For existing Alpha 7 users, just copy over the new CircleDock.exe into your current Circle Dock folder so that you can retain your existing dock items and settings. • Alpha 7_1 fixes the setting panel options to turn off the screen edge toggling of the dock visibility. • Use "Icon Replacement Mode" in the right-click menu of the centre button to quickly replace the original icons with higher resolution ones. In this mode, you can just drag and drop new PNG images over top of the dock icons, centre button, and background and they will be replaced right away. • New Settings Panel with many options. • Be default, Circle Dock 0.9.2 Alpha 7 uses your middle mouse button and the F1 key on your keyboard to toggle visibility. Both can be changed in the settings panel. • Moving your mouse to either the left or right edge of your screen toggles visibility. This can be turned off. • You can know grab the background and move the dock. • You can resize all the elements of the dock in the settings panel. • Add the ability to use the default high-resolution icons for Windows Vista users so they don't have to change all the icons. Windows XP users won't see a difference because they don't have high resolution icons. • Thumbnails of files are now displayed in the correct aspect ratio instead of being stretched. • Settings Panel can now be minimized like a normal window. • Added the ability for Circle Dock to self repair and upgrade the Config.ini file which means that from now on, users can upgrade by just copying the newest CircleDock.exe file into their current Circle Dock directory. • Includes a French language file courtesy of Thomas Favre. • Fixed the hotkey problem where you could not change the hotkeys. • Fixed the bug where if you set the number of key presses per rotation to 0, the dock would not load properly. • Included a new background image of double rings courtesy of Syllabus. • Language files included now are: French, English, Portuguese, and Russian. Thanks to the translators. • All language and settings .ini files are now encoded in unicode to enable greater support for languages with non-standard characters. • Many bug fixes and some new features added. • Added the ability to run multiple docks at the same time by allowing multiple Circle Dock instances to run from separate folders. 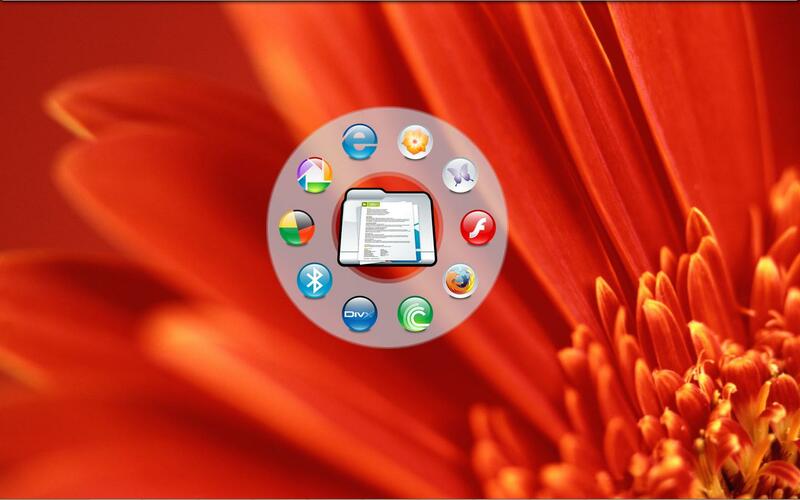 • Circle Dock will now seek the target file for shortcuts dropped onto the dock. • Added ability to lock the dock at a specific position (Settings Panel -> Location). • The .ini file reader for Circle Dock is now unicode compatible with non-western script characters. This solves the problem of garbled language files. • There are new language files included, such as Chinese, Indonesian, and Hungarian. Some language files have not been updated. Missing translations will show up in Circle Dock as "?????". • New circular backgrounds are included. • Added an "Item Properties" panel for each dock item to allow you to edit the link properties. • Added an option in the right-click menu for the centre object, background, and the tray icon to temporarily pause the mouse toggling for gamers or other people that need it. • The screen edge toggling has been improved. Circle Dock won't toggle the visibility if you are holding a mouse button down near the screen edges. There is also a new option for the dwell time required. • The "Toggling" and "File -> Icon Associations" panels in the "Settings Panel" have been simplified. • Added ability to turn off labels. как ее ставить?? на 7 пойдет? ?